Hybrid technology has changed the face of the automotive world. A bright future beckons for the manufacturers who have indulged in hybridism as a stable source of power for their cars. BMW, as ever, has kept up with any new technology. And now BMW offer the consumer a brand new BMW 5 Series model called the BMW Active Hybrid 5. Let’s take a closer look. 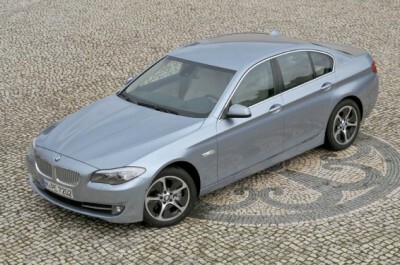 We’ll start with the driving force because we all know how good the BMW 5 Series looks and drives. Electricity burns cleanly, and what a natural source to tap into for making your car burn less fossil fuel and go for longer in the process. With the stunning new BMW Active Hybrid 5, fully electric driving is used as often as possible in urban driving situations. In urban traffic the BMW ActiveHybrid 5 uses the 40 kW electric motor as much as possible; and with the motor being linked to one of the most advanced eight-speed automatic transmissions, the power is kept as efficient as possible. Whenever the petrol motor is running, the charge for the electric motor is topping up for the next time it will be employed. Brake energy regeneration technology is a way of capturing the energy released when the brakes are employed. Again, this energy charges the battery which fuels the electric motor. While the electric motor is running, the circuit takes the petrol motor from out of the equation, thus saving on fuel and lowering the car’s overall CO2 emissions. Located just behind the 225 kW/400 Nm petrol engine, the electric motor simply takes over the driveline when the petrol motor times out. We all love the supreme power of BMW’s Twin-Turbo straight-six engine. With the BMW Active Hybrid 5, the huge power output of the Twin-Turbo is added to for when additional power reserves are required. Imagine yourself cruising along the highway and you pull out to pass slower traffic. Out of the blue an oncoming car comes into view; so you need as much acceleration as you can for completing the manoeuvre as swiftly and as safely as possible. This is when the BMW Active Hybrid 5 uses its Boost function and will employ the additional power of the Hybrid engine with the power of the Twin-Turbo petrol engine. More power is released through the drivetrain out to the rear wheels for a short spell. For speeds up to 160 km/h, when the BMW ActiveHybrid 5 driver takes the foot off the accelerator and coasts, the combustion engine is switched off. The kinetic energy provides enough propulsion for the car to coast along without using fuel. Start/Stop technology is part of the BMW Active Hybrid 5 make-up, so as you brake to stop at the traffic lights the petrol engine is switched off. Braking energy is used to top up the electric battery – and there you have it: less fuel, less fumes and more power for driving in urban situations without the petrol motor needing to be used. The BMW Active Hybrid 5 model is lavishly equipped with all the very best luxury features you would expect. Satellite Navigation, Bluetooth communications and electronic leather seats are just some of the nice features on-board to make the drive in a BMW ActiveHybrid 5 as special as the motors that are running it. Full Twin-Turbo power combined with city running that is more efficient than highway running – yes you read this right – and you have yourself a special car that is turning the way a conventional car drives completely upside down. For any more information on the BMW ActiveHybrid 5 or, for that matter, any other new car, contact one of our friendly consultants on 1300 303 181. If you’d like some fleet discount pricing (yes even for private buyers! ), we can submit vehicle quote requests out to our national network of BMW dealers and come back with pricing within 24 hours. Private Fleet – car buying made easy!